Chronic obstructive pulmonary disease (COPD) is a challenging respiratory problem throughout the world. 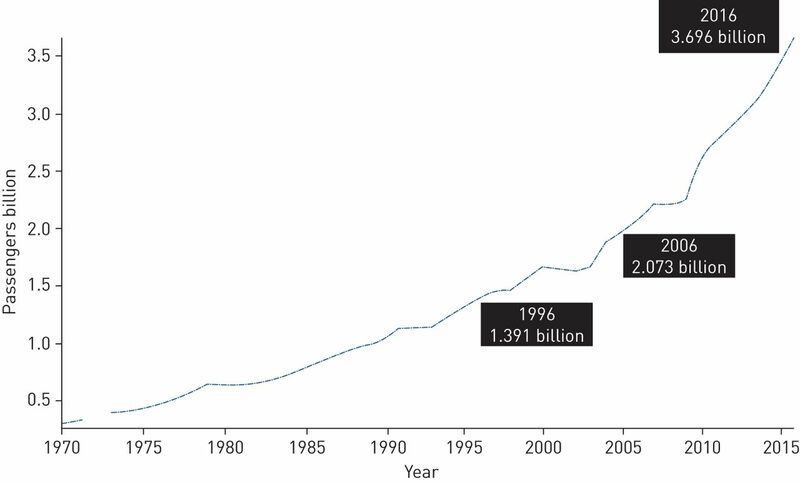 Although survival is prolonged with new therapies and better management, the magnitude of the burden resulting from moderate-to-severe disease is increasing. One of the major aims of the disease management is to try to break the vicious cycle of patients being homebound and to promote an active lifestyle. A fundamental component of active daily life is, of course, travelling. Today, the world is getting smaller with the option of travelling by air. Air travel is usually the most preferred choice as it is easy, time saving, and relatively inexpensive. Although it is a safe choice for many passengers, the environment inside the aeroplane may sometimes have adverse effects on health. 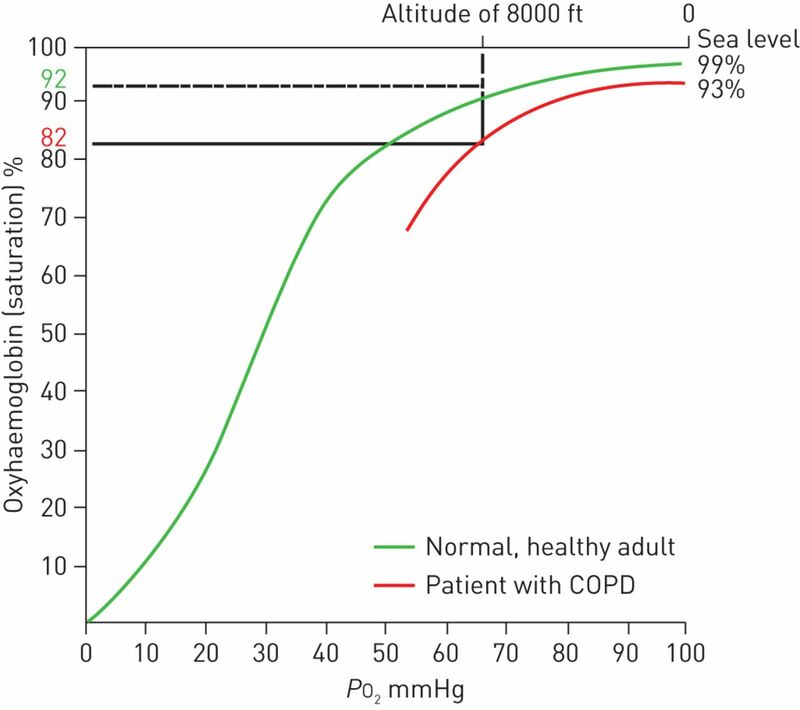 Hypobaric hypoxaemia due to cabin altitude may cause health risks in COPD patients who have limited cardiopulmonary reserve. Addressing the potential risks of air travel, promoting proactive strategies including pre-flight assessment, and education of COPD patients about the “fitness to fly” concept are essential. Thus, in this narrative review, we evaluated the current evidence for potential risks of air travel in COPD and tried to give a perspective for how to plan safe air travel for COPD patients. Chronic obstructive pulmonary disease (COPD) is a preventable disease that is characterised by airflow limitation. The prevalence and burden of COPD are projected to increase over the coming decades due to an ageing world population and, according to World Health Organization estimates, currently 65 million people have moderate-to-severe COPD . Recent data confirm this projection by a fall of 23% in age-standardised death rates and prolonged life expectancy in COPD . Thus, the number of patients with severe disease and chronic respiratory failure will increase in the near future. In contrast to historic beliefs, COPD is now considered a treatable disease . Our perspective about the disease and the management algorithms has changed markedly. We now aim to optimise our patient's wellbeing both physically and psychologically and increase their quality of life as much as possible. Individualised medical treatments, effective management of exacerbations and comorbidities, encouragement of physical activity and rehabilitation are the cornerstones of COPD management. Developments in technology and the wide availability of supportive treatments such as rehabilitation, long-term oxygen therapy, ambulatory oxygen support and noninvasive ventilation helped patients to become more physically active and mobile. Instead of being homebound, most of the COPD patients usually continue their daily life, such as going out, taking part in sports, and of course travelling. Within years, air travel became the first choice mode of travel. It is fast, practical and becoming less expensive. According to World Bank data, 3.696 billion persons used commercial air travel worldwide in 2016 (figure 1) . World Bank Data for numbers of passengers who travelled by air between 1970 and 2016. Reproduced from  with permission. A comprehensive background literature search has been carried out in PubMed and other search engines with the keywords “air travel”, “flight”, “patient”, “fitness to fly”, “chronic obstructive pulmonary disease” and “oxygen supplementation”. Relevant articles were chosen and reference lists were checked for publications related to the subject. In addition, patient-centred information websites prepared by different organisations were screened and the content was assessed. Modern commercial aircrafts are safe and comfortable. Aircrafts for long-haul flights can cover more than 5000 kilometres and fly for up to 14 h without stopping. To fly as economically as possible over long distances, the general rule is to use wide-body aircrafts with a large number of seats. Contrary to popular belief, the aircraft cabin is not pressurised to ground level equivalent. For mechanical and economic reasons, it is practically impossible to maintain a ground level equivalent pressure at high cruising altitudes [7–10]. Thus, aircraft cabins are designed with pressure differentials, which represent the compromise between the physiological ideal and the optimal technological design. Regulatory governmental agencies require aircraft cabins be pressurised to simulate an altitude of 2438 m (8000 ft cabin altitude) and allow only short diversions to a cabin altitude of 3048 m (10 000 ft) for safety reasons . However, cabin altitude may vary to an extent and it was reported that cabin altitude >8000 ft was observed in up to 10% of flights [9–12]. It may also sometimes be necessary to have higher altitudes with lower cabin pressures especially towards the end of intercontinental flights as the aircraft gets lighter because of the fuel used . The threshold of altitude-induced hypoxaemia is generally considered to be 1000 m (3300 ft) and the selection of 2438 m was based on the oxyhaemoglobin dissociation curve which shows that up to that level the arterial oxygen saturation (SaO2) normally remains above 90% in the average healthy individual [9, 10]. The risk of flying is relatively low for a healthy individual. But one has to bear in mind that the initial effects of unrecognised hypoxaemia are usually insidious, with reduced cognitive function and other mild symptoms occurring some time before significant, more readily recognised clinical events, such as chest pain, shortness of breath, seizures and loss of consciousness . A medical emergency occurs in 1 out of every 604 flights and per 30 000 passengers [14, 15]. Respiratory illnesses comprise ∼12% of all in-flight emergencies; other emergencies include syncope (37.4%), cardiac symptoms (7.7%), stroke (2%) and cardiac arrest (0.3%) . Most of those in-flight emergencies, around 65%, are due to a pre-existing medical condition . The rate of in-flight death is 0.3% of in-flight emergencies and one per 3 to 10 million passengers [14, 15, 17]. Diversion due to a medical emergency is ∼7–11% of total in-flight medical events and respiratory symptoms were reported as the third most frequent cause of diversion [14, 18, 19]. Flight diversions due to medical emergencies carry a significant financial and legal cost. Ground-based medical services including telemedicine are considered to be helpful for obtaining valuable medical advice, making the decision of diversion, minimising the risk for the sick passenger, and decreasing the possibility of inconvenience for other passengers . Ideally, implementing a proactive prevention strategy including pre-flight screening for these groups of passengers may reduce in-flight adverse events and therefore diversions due to a medical problem. The medical risk of flying does not stop upon arrival at the destination. Another problem that is usually unnoticed is the need for healthcare utilisation after flying. It was observed that unscheduled healthcare use in patients with respiratory problems is up to 20% within the first month after a flight . The primary difference between the aircraft cabin and ground environment is the atmospheric pressure and in most passenger aircrafts the cabin pressure at cruising level corresponds to an ambient altitude of 1500–2450 m (5000–8000 ft) . This specific cabin pressure causes hypobaric hypoxaemia. As a result of low barometric pressure, the inspired oxygen tension decreases in turn leading to a fall in alveolar oxygen tension and consequently arterial oxygen tension (PaO2) [21–23]. While the barometric pressure at sea level is 760 mmHg (101 kPa), which corresponds to a PaO2 of 96–98 mmHg (13 kPa), the barometric pressure at 8000 ft is about 565 mmHg (75 kPa) resulting in a PaO2 level of 55 mmHg (7.3 kPa) (750 mmHg = 100 kPa; 100 mmHg = 13.3 kPa). In healthy individuals, PaO2 levels are between 53 and 75 mmHg (7–10 kPa) and this causes a 3–4% decrease in SaO2 which is usually >90% (figure 2) [24–26]. This results in tissue hypoxia (hypobaric hypoxia) from inspiring oxygen-poor air, which causes compensatory physiological changes at high altitude both at rest and during exercise [19, 21, 27]. Compensatory mechanisms for hypoxaemia are increased minute ventilation, increased heart rate and, therefore, cardiac output for maintaining oxygen delivery [21, 25, 27, 28]. Pulmonary vasoconstriction redistributes pulmonary blood flow to the apical regions of the lung to reduce ventilation-perfusion mismatch and helps to maintain PaO2 . In a recent study consisting of 1260 healthy individuals, no significant changes occurred in arterial oxygen saturation measured by pulse oximetry (SpO2) during a simulated 8 h flight . However, if the flight altitude is >3050 m (10 000 ft), hypoxaemia becomes more prominent and SaO2 is ∼89% in a healthy individual . Aircraft crew and all passengers must use supplemental oxygen when cabin pressure altitudes exceed this level in order to prevent hypoxaemia-related symptoms [9, 30]. Supplemental oxygen has been shown to reverse altitude-induced hypoxaemia [31–33]. Oxyhaemoglobin dissociation curve for healthy individuals and patients with chronic obstructive pulmonary disease (COPD) at high altitude. PO2: oxygen tension. Reproduced from  with permission. Compared to healthy individuals, passengers with moderate-to-severe COPD have a higher risk for experiencing significant hypoxaemia during air travel [30, 31, 33]. People who already have reduced PaO2 have a further decline in PaO2, which may be below critical limits (figure 2). The physiological reserve of the patient determines the degree of hypoxaemia. Additionally, even minor exercise in these patients causes further decrease in PaO2 [30, 34, 35]. Maximal aerobic exercise capacity is decreased at high altitudes due to a decrease in arterial oxygen content . Theoretically, hypercapnia indicates poor pulmonary reserve in COPD and patients who have elevated arterial carbon dioxide tension (PaCO2) may experience more severe hypoxaemia during flying. However, this issue is still controversial as there is limited data. Both simulation and in-flight studies showed that PaCO2 decreases in response to hypoxaemia-induced hyperventilation [33, 34]. Hypoxaemia-induced hyperventilation, in turn, may result in hyperinflation and, therefore, increased intrinsic positive end-expiratory pressure, which is mainly responsible for respiratory muscle fatigue in severe COPD especially during long-haul flights (figure 3) . Pathophysiological changes in chronic obstructive pulmonary disease during air travel. PIO2: inspired oxygen tension; PAO2: alveolar oxygen tension; PaO2: arterial oxygen tension; PaCO2: arterial carbon dioxide tension; PEEP: positive end-expiratory pressure; RV: right ventricle. Pulmonary artery pressure increases due to hypoxic vasoconstriction during air travel even in healthy individuals without any pre-existing cardiopulmonary disease . Increase in pulmonary artery pressure is more pronounced in COPD patients with pre-existing pulmonary hypertension. This may lead to an increase in right ventricle afterload and eventually right ventricular dysfunction [27, 37]. Acute hypoxaemia leads to sympathetic activation through peripheral chemoreceptors, which is responsible for increases in heart rate, blood pressure, myocardial contraction velocity and cardiac output . Life-threatening organ dysfunction such as cardiac arrhythmias and ischaemia and chest pain may occur in susceptible patients who are unable to respond sufficiently to these physiological requirements during flights [33, 39]. Falling asleep is a natural behaviour during long-haul flights. It has been shown that sleep may cause desaturations during flights, which are even more pronounced than those that occur during exercise . Still, in healthy subjects, SpO2 stays within the acceptable range. However, sleep may cause relatively significant desaturations in COPD patients who are more vulnerable to hypoxaemia. During sleep, COPD patients without hypoxaemia at rest may experience severe nocturnal desaturations; patients who are already hypoxaemic may experience worsening of hypoxaemia . In addition, taking alcohol or other sedatives, including sleeping pills, may exacerbate this problem by increasing sleepiness and actual sleep time. During ascent, another problem is the expansion of gases. According to Boyle's law, the volume of gas is inversely proportionate to the pressure. Hence, at high altitudes, the volume of gas expands compared to its value at sea level. As an example, 1 L of gas will expand to ∼1.4 L at an altitude of 2450 m . It is not a problem when all alveolar units are vented through the trachea; however, when the gas is confined in a closed unit such as blebs, rapid ascent may cause expansion of gases which may cause problems especially in COPD patients with bullous emphysema or previous history of pneumothorax [19, 43]. Although the majority of studies showed that COPD patients develop hypoxaemia during actual or simulated flights, few patients' experience severe symptom complications due to hypoxaemia. Individuals with limited cardiopulmonary reserve usually have symptoms, and in-flight emergencies due to hypoxaemia-related respiratory symptoms account for 9–12% [14, 18, 19]. However this rate increases to 18% in patients with lung diseases . In a study, 391 COPD patients were evaluated retrospectively and a quarter reported hypoxaemia-related symptoms . Symptoms were strongly associated with severe breathlessness (higher dyspnoea scores) and exercise desaturation during a 6-min walk test. Compared to non-COPD controls, COPD patients had a seven-fold higher risk of experiencing dyspnoea and air hunger. Other than dyspnoea and air hunger, hyperventilation, light-headedness, chest pain, tingling in the extremities and palpitations may occur [33, 34]. These insidious symptoms can be under-recognised both by the patients' themselves and clinicians. COPD patients may become more symptomatic with minimal activity like walking down the aisle or going to the toilet, especially on long-haul flights in which intermittent activity is encouraged. In the current commercial fleet, the ratio of fresh air to re-circulated air is usually about 50:50 during the flight. . Air density and temperature also decrease with ascent. The air inside the cabin is drawn from outside and then heated, filtered and humidified to 10–20% and around 20 to 30 complete air exchanges occur per hour . Low air humidity in the cabin may cause not only minor symptoms such as irritation and dehydration of the eyes, nose and upper airways but also respiratory symptoms due to irritation of the lower airways. These factors may increase insensible water loss and contribute to airway reactivity. Increased ventilation in response to hypoxaemia may also provoke dehydration of airway mucosa which in turn results in respiratory symptoms. There is still no consensus about which patient to refer before air travel and the gold standard test of assessment of hypoxaemia in COPD. COPD patients with dyspnoea on exertion, forced expiratory volume in 1 s (FEV1) <1.5 L or FEV1 <30% predicted, a pre-existing requirement of oxygen/ventilatory support, bullous lung disease, comorbid conditions that may worsen hypoxaemia like cardiac disease and significant symptoms during previous air travel are considered as high risk and need further evaluation [8, 19, 25, 46]. General well-being, symptoms, recent exacerbation history and ongoing treatments should be evaluated and all COPD patients should undergo physical examination before a planned flight. The opinions of respiratory physicians regarding assessment methods and criteria for recommending in-flight oxygen seem to vary . Coker et al. evaluated patients who were referred for pre-flight assessment and the most common diagnoses for referral were COPD (39%), diffuse parenchymal lung diseases excluding sarcoidosis (23%), asthma (15%), bronchiectasis (8%) and sarcoidosis (7%). The tests used for the pre-flight assessment were reported as oxygen saturation in 96%, pulmonary function test in 95%, hypoxic challenge test (HCT) in 45% and walk test in 10%. Previous guidelines usually support the use of SpO2 as an initial step [47, 48]. Depending on SpO2 value and other risk factors the patients may have, additional tests are helpful for risk stratification and need for supplemental oxygen on the aircraft. For COPD patients, we suggest using an algorithm that is developed using a combination of recent literature data (figure 4). Whatever the evaluation method, clinicians should make certain of two important points. First, patients should receive the optimal medical treatment according to disease severity and, secondly, patients must be in a stable period for a while, ideally at least 6 weeks, without any recent exacerbations. Algorithm for the assessment of fitness to fly in chronic obstructive pulmonary disease patients. LTOT: long-term oxygen therapy; PaO2: arterial oxygen tension; SpO2: arterial oxygen saturation measured by pulse oximetry; 6MWT: 6-min walk test. #: if dyspnoea on exertion, forced expiratory volume in 1 s <1.5 L or <30% predicted, a pre-existing requirement of oxygen/ventilatory support, bullous lung disease, comorbid conditions that may worsen hypoxaemia like cardiac disease and significant symptoms during previous air travel. The easiest way to evaluate a patient for fitness to fly is pulse oximetry. Measurement of pre-flight SpO2 is usually the first step used as a screening method . It is usually accepted that for patients with a resting SpO2 >95% at sea level, the risk of hypoxaemia is relatively low and in-flight oxygen is not needed [47–49]. Patients with SpO2 ≤95% need further testing, especially when there is a history of in-flight symptoms or an adverse event or cardiac comorbidity. However, these cut-off levels are mostly arbitrary and may not be sufficient enough to select patients with higher risk in COPD. Akero et al. divided 100 COPD patients into groups according to SpO2 and risk factors before performing HCT. It was seen that the percentage of patients who dropped to PaO2 <50 mmHg (6.6 kPa) were: 30% in the SpO2 >95% group, 67% in the SpO2 92–95% and without additional risk factors group, 70% in the SpO2 92–95% and additional risk factors group, and 83% in the SpO2 <92% group . Robson et al. also showed that one-third of patients with sea level SpO2 between 92% and 95% and with no any additional risk factor desaturated during HCT. With respect to these findings, pre-flight SpO2 alone seems to be an unreliable tool for the decision of fit to fly and does not help to discriminate COPD patients adequately for in-flight oxygen supplementation. Pre-flight arterial blood gas analysis is usually needed if the patient's sea level SpO2 is <95%. The Aerospace Medical Association recommends sea level blood gas analysis as a baseline evaluation before flying in at-risk patients and a pre-flight PaO2 >70 mmHg (9 kPa) is considered to be safe for flying without oxygen supplementation . If the PaO2 level is not >70 mmHg then it is recommended to undergo pre-flight diagnostic evaluation either with a hypobaric chamber or HCT in a specialised centre. However, the predictive value of PaO2 is questionable in COPD. Although earlier studies showed that sea level PaO2 correlated well with expected altitude PaO2 [33, 51], consequent studies showed that sea level PaO2 may not be predictive for desaturation during flying in COPD (table 1) [30, 34, 35, 52]. Christensen et al. studied severe COPD patients and showed that a sea level PaO2 >70 mmHg does not exclude the development of severe hypoxaemia. An interesting finding was even minor exercise, such as walking along the aisle, induced severe hypoxaemia in these patients. Desaturation with exercise, assessed with the 50-m walk test, in COPD patients was also shown in another study in which the post-exercise PaO2 is 6 mmHg which is lower than pre-exercise values . Akero et al. performed an in-flight study and evaluated arterial blood gas on board in 18 moderate-to-severe COPD patients. Pre-test SpO2 was >94% in all patients and they had all passed the 50-m walk test. It was shown that there was a decrease in mean PaO2 from 77 to 64.5 mmHg and it remained stable throughout the flight (about 6 h) in all patients except one. In this cohort, pre-flight PaO2 >70 mmHg did not predict an acceptable in-flight PaO2. Although five patients desaturated more than the acceptable range, none of them had any clinical worsening. In the absence of any contraindication, spirometry is advised in patients with a history of acute or chronic lung disease or with symptoms suggestive of lung disease [25, 28]. However, lung function parameters failed to predict either hypoxaemia or complications [30, 49, 53, 59]. The results about diffusing capacity are conflicting as well, but it was previously shown in one study that patients with diffusion impairments are likely to experience the greatest altitude desaturations . However, Dillard et al. reported that using FEV1 as an additional parameter might improve predictive yield for estimating in-flight PaO2. Some authors also suggest using maximal voluntary ventilation (MVV) [25, 60]. Patients with a MVV <40 L·min−1 are considered as high risk for decompensation during air travel. Practically, patients who can complete a 50-m walk (or climb 10–12 stairs) without any distress are considered to have sufficient cardiopulmonary reserve for flying [8, 47]. Recently, the 6-min walk test has become more popular and is often used for the assessment of functional capacity and exercise-induced hypoxaemia in COPD patients [41, 54, 55, 57, 61]. Chetta et al. showed that SpO2 during 6-min walk test could predict in-flight oxygen desaturations. In a recent study, an algorithm using both resting and 6-min walk test SpO2 values may be a reliable tool for estimation desaturation during flying . Resting SpO2 >95% combined with a 6-min walk test SpO2 >84% had a sensitivity of 100% and specificity of 80% for “fitness to fly”. The results of this study deserve specific attention and must be validated with new studies as: 1) it shows good correlation with HCT; and 2) it is an easy and inexpensive test that is currently being performed in many centres. Several equations were offered for the estimation of in-flight PaO2 both in healthy individuals and patients with COPD [19, 62, 63]. Some of these equations just use sea level PaO2 whereas others also take into account PaCO2, FEV1, FEV1/forced vital capacity and diffusing capacity which may improve the accuracy of predicted value. In a meta-analysis, multiple regression equations have been found to be a good estimate for PaO2 at 8000 ft in normocapnic COPD patients . One drawback is there are huge variations among equations and poor agreement with altitude simulated PaO2 [64–66]. Bradi et al. compared 16 predictive equation formulas with HCT in 27 subjects (22 with COPD) and showed that predictive equations provide poor estimates of PaO2 measured during HCT. In addition, predictive equations reported overestimating in-flight O2 need when compared to altitude simulation . More validation studies are required for these equations for routine use especially in the COPD population. HCT (also known as hypoxia altitude simulation test, high altitude simulation test or normobaric hypoxia inhalation test) is the simulation of an aircraft cabin with decreased inspiratory oxygen fraction (FIO2) in the normobaric environment. The test is considered a reliable tool in predicting hypoxaemia measured during air travel both in healthy subjects and COPD patients . It was shown that SpO2 in HCT was well correlated with in-flight mean SpO2 . However, in a recent study PaO2 in HCT was not associated with the presence of symptoms during air travel . Referral to HCT is usually due to a SaO2 value <92–95% at sea level or suspicion of possible in-flight hypoxaemia. Patients who experienced symptoms that may be considered as a consequence of desaturations are also candidates for HCT. At an altitude of 2438 m, FIO2 inside the aircraft is 15.1%. Therefore, the test begins with the subject breathing a mixture of gas containing 15% O2 from a tight fitting mask for 20 min. The patient is monitored for symptoms, SpO2 and change in vital signs including heart rate during the whole period. After 20 min, an arterial blood gas is performed for evaluation. If the PaO2 level is >50 mmHg (SpO2 ≥85%), supplemental oxygen is not required for the flight . If PaO2 is <50 mmHg (SpO2 <85%), the test can be repeated with supplemental oxygen at a usual rate of 2–4 L·min−1 . Although HCT is used for the prediction of in-flight hypoxaemia, the clinical relevance of the test has not been validated and further research is needed to determine its actual place in the pre-flight assessment of respiratory patients [7, 19, 67]. In addition, even PaO2 during HCT is well correlated with the in-flight PaO2 level; it has limited predictive value for prediction of in-flight symptom occurrence. Another important drawback of the technique is HCT should be conducted at specialised centres with advanced equipment and monitoring options and medical staff experienced in performing the test. The hypobaric chamber test simulates the hypobaric environment of an aircraft cabin altitude of 2438 m. However, this test is generally only used for research purposes. How should COPD patients be prepared for flying? All passengers with COPD need to be evaluated for risk for flying and every intervention to decrease the risk and prevent an adverse event should be encouraged. Past medical history including comorbidities and ongoing treatments, clinical assessment, discussion about flying, any previous flying history of symptoms and possible risks and contraindications should be assessed. Co-existence of pulmonary and cardiac diseases needs specific consideration because of the close interactions between the two systems. Preparation before flying consists of optimisation of COPD treatment, the risk for in-flight hypoxaemia and supplementation of oxygen when needed. Most of the time, these steps are performed in oxygen-dependent patients with chronic respiratory failure and skipped in less severe COPD patients but, ideally, all COPD patients need to know that they should seek medical advice before flying. For patients with a bullous disease or previous history of pneumothorax, a pre-flight chest radiograph is encouraged . Family physicians are usually the first healthcare provider before air travel and therefore should also get involved and educate patients on the risks of flying, as well as increasing awareness and educating COPD patients. Travel should be postponed, optimally for 6 weeks, in case of a recent exacerbation. All therapies that the patient is taking should be reviewed and prescribed as so cover the duration of travel. In addition, health insurance coverage both for additional treatments and hospitalisations that may be needed should also be pre-planned. Patients may have a frequent travellers medical card (FREMEC); this avoids the necessity to obtain medical clearance for each journey and describes the passenger's medical needs and special handling requirements. . Several websites are now available for information both for patients and healthcare providers (table 2). During the flight, patients should keep all medications within reach on board, take direct flights, ensure adequate hydration, do intermittent leg exercises and select a seat near to the toilets, preferably on an aisle. Patients who are at-risk for desaturation during sleep should be warned about avoiding alcohol intake and other sedatives during long flights. The safe threshold for oxygenation is to keep PaO2 >50 mmHg and SpO2 ≥85% during the flight. Oxygen supplementation should be considered in patients who are expected to have lower values during air travel. It was shown that patients with supplementation reported having fewer symptoms during a flight . Supplemental oxygen systems can be arranged either by the patient themselves or by the airline. Current regulations, with possible costs, of many airlines can be found in the European Federation of Allergy and Airways Diseases Patients' Association booklet on enabling air travel with oxygen in Europe . Patients receiving long-term oxygen therapy can take their own cylinders if the airline accepts. Therefore, checking with the airline about these options should be encouraged. Passengers are responsible for notifying the airline about their needs and acting accordingly. Oxygen supplementation can be obtained by the airline after a report indicating oxygen requirement and its prescription by the physician. Usually, flight approved compressed gas cylinders are the first choice option for short flights [28, 69], but portable oxygen concentrators are more convenient, especially for long-haul flights. It can also be used on the ground during transit. Many airlines also accept pulsed systems. However, in a study comparing different sources of supplemental oxygen, compressed gas with continuous flow and an oxygen-conserving device resulted in the same PaO2 whereas a portable oxygen concentrator showed significantly lower PaO2 values. In order to achieve the acceptable PaO2 values, it is advised to increase the flow in portable concentrators . The battery life and maximum possible oxygen output should also be taken care of, as it may be a problem for long flights . The main responsibility for flying belongs to the patient but according to regulatory laws, airlines can also refuse carriage of the patient if there is a safety concern [8, 19]. Supplemental oxygen delivered at 2–4 L·min−1 should maintain clinically acceptable oxygenation during commercial air travel in most patients with COPD. For patients who are already on long-term oxygen therapy it is usually advised to double the flow rate, however, patients who need oxygen >4 L·min−1 at sea level may be unable to travel as most airlines cannot deliver oxygen with a double rate. Patients with long-term oxygen therapy should also plan their oxygen supplementation to their final destination. A nasal cannula is the most commonly used option for delivery and the International Air Transport Association reports using a nasal cannula system as the delivery of oxygen is similar to a mask . Depending on patients' clinical status, the Venturi mask can be an option for assuring a certain FIO2 in patients who are susceptible for depression in respiratory drive with high flows of oxygen . Supplemental oxygen may cause beneficial haemodynamic changes and correct arrhythmia caused by hypoxaemia in patients with COPD during acute hypobaric exposure ; however, nifedipine may be an option to prevent worsening of right heart function in patients with severe pulmonary hypertension due to COPD . Of note, use of first-aid oxygen bottles and drop-down oxygen masks for supplementation is prohibited as most airlines carry a very limited supply of oxygen which is only to be used in case of an emergency, such as depressurisation of the cabin . Jet lag, loss of circadian rhythm and sleep disturbances may be an important problem, especially in overseas flights. General advice and treatment options for jet lag (sleep hygiene, melatonin, etc.) are also valid for COPD patients. It has been shown that hypoxaemia can cause coagulation activation in COPD patients . The risk increases after 4 h and peaks at 8 h . Patients with low risk should be warned to avoid tight clothing below the waist and try to rehydrate during the flight. Moving along the aisle may be an option for patients without risk of desaturation. If the patient has a risk of desaturation, below knee compression stockings and calf stretching exercises while sitting may be a safe alternative . Patients with high risk of thromboembolism (previous venous thromboembolism history, known active malignancy, known thrombophilia, and major surgery within 6 weeks) should ask for individual help for prophylactic low molecular weight heparin. Aircraft cabin air quality during flights is generally acceptable and often better than many other indoor environments . Although the air inside the cabin is circulated by 50% of total and high-efficiency particulate air filters are used, there is still a risk of infection transmission. The outbreak of severe acute respiratory syndrome drew attention to the transmission of infection during air travel. Respiratory viruses and influenza may be a considerable problem in COPD patients as they are responsible for a high percentage of exacerbations. Patients should be warned, especially for outbreaks, and should be advised to postpone travel if necessary. With optimised care, patients can fly without any additional risk. Clinical and functional evaluation for fitness to fly and possible risk factors for in-flight hypoxaemia should be assessed in all COPD patients before flying. From the literature reports so far, it seems reasonable to conclude that many patients tolerate significant hypoxaemia without any symptoms or an adverse event. However, proactive strategies to identify patients at risk and implementing preventive measures for adverse events in high-risk patients should be encouraged in order to achieve better disease management. We have to keep in mind that it is now time to take care of our patients, not only on the ground but also in the air. World Health Organization. Burden of COPD. www.who.int/respiratory/copd/burden/en/ Date last accessed: January 20, 2018. GBD 2015 Mortality and causes of death collaborators. Global, regional, and national life expectancy, all-cause mortality, and cause specific mortality for 249 causes of death, 1980–2015: a systematic analysis for the Global Burden of Disease Study 2015. Lancet 2016; 388: 1459–1544. Global Strategy for the Diagnosis, Management and Prevention of COPD. Global Initiative for Chronic Obstructive Lung Disease (2017). http://goldcopd.org Date last accessed: March 7, 2018. The World Bank. Air transport, passengers carried. https://data.worldbank.org/indicator/IS.AIR.PSGR Date last accessed: March 7, 2017.
. Preflight medical screenings of patients. Analysis of health and flight characteristics. Chest 1993; 104: 788–794.
. Medical issues associated with commercial flights. Lancet 2008; 373: 2067–2077.
. Preflight medical screening of patients. Eur Respir J 2000; 16: 197–199. IATA. Medical Manual, 10th edition. February 2018. www.iata.org/publications/Documents/medical-manual.pdf Date last accessed: March 7, 2018. Aerospace Medical Association, Aviation Safety Committee, Civil Aviation Subcommittee. Cabin cruising altitudes for regular transport aircraft. Aviat Space Environ Med 2008; 79: 433–439. International Civil Aviation Organization. Manual of Civil Aviation Medicine. 3rd edition, 2012. www.icao.int/publications/Documents/8984_cons_en.pdf Date last accessed: February 28, 2018. Altitude exposures during commercial flight: a reapraisal. Aviat Space Environ Med 2013; 84: 27–31. Directly measured cabin pressure conditions during Boeing747–400 commercial aircraft flights. Respirology 2007; 12: 511–515.
. Oxygen supplementation for chronic obstructive pulmonary disease patients during travel. Curr Opin Pulm Med 2006; 12: 140–144. Outcomes of medical emergencies on commercial airline flights. N Eng J Med 2013; 368: 2075–2083.
. In-flight medical emergencies. Dtsch Arztebl Int 2012; 109: 591–601.
. Emergencies in the air. Emerg Med J 2005; 22: 658–659. Emergencies in the sky: in-flight medical emergencies during commercial air transport. Trends Anesth Crit Care 2013; 3: 179–182. In-flight medical emergencies during airline operations: a survey of physicians on the incidence, nature, and available medical equipment. Open Acc Emergency Med 2017; 9: 31–35. Managing passengers with stable respiratory disease planning air travel: British Thoracic Society recommendations. Thorax 2011; 66: i1–i130.
. Is air travel safe for those with lung disease? Eur Respir J 2007; 30: 1057–1063.
. Aviation medicine. problems of altitude 1: hypoxemia and hyperventilation. Br Med J 1983; 286: 1408–1410. Normobaric hypoxia inhalation test vs response to airline flight in healthy passengers. Aviat Space Environ Med 2006; 77: 1143–1147. Hypoxemia in health subjects in moderate altitude. Aviat Space Environ Med 2013; 84: 22–26. Inflight arterial saturation: continuous monitoring by pulse oximetry. Aviat Space Environ Med 1995; 66: 126–130.
. Hypoxia during air travel in adults with pulmonary disease. Am J Med Sci 2008; 335: 71–79.
. So you think you can fly? Determining if your emergency department patient is fit for air travel. Can Fam Phys 2009; 55: 992–995.
. Lung disease at high altitude. Expert Rev Respir Med 2009; 3: 635–650.
. Fitness to fly in patients with lung disease. Ann Am Thorac Soc 2014; 11: 1614–1622. Health effects of airline cabin environments in simulated 8-hour flights. Aerosp Med Hum Perform 2017; 88: 651–656. Development of severe hypoxaemia in chronic obstructive pulmonary disease patients at 2,438 m (8,000 ft) altitude. Eur Respir J 2000; 15: 635–639. Oxygen supplementation during air travel in patients with chronic obstructive pulmonary disease. Chest 1992; 101: 638–641.
. Assessment of oxygen supplementation during air travel. Thorax 1996; 51: 202–203. Hypoxia-altitude simulation test. Evaluation of patients with chronic airway obstruction. Am Rev Respir Dis 1984; 130: 980–986. 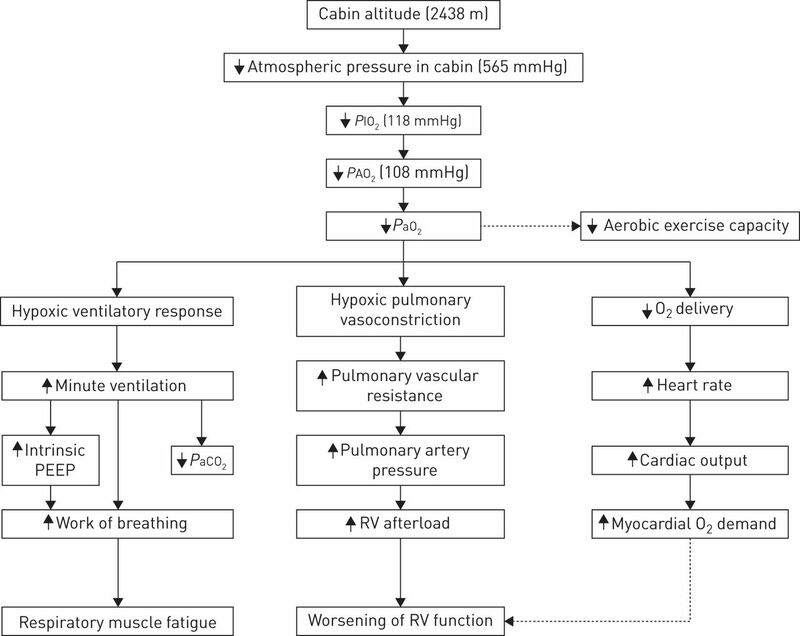 Hypoxaemia in chronic obstructive pulmonary disease patients during a commercial flight. Eur Respir J 2005; 25: 725–730. Effect of simulated commercial flight on oxygenation in patients with interstitial lung disease and chronic obstructive pulmonary disease. Thorax 2004; 59: 966–970. Pulmonary artery pressure increases during commercial air travel in healthy passengers. Aviat Space Environ Med 2012; 83: 673–676. Flying with respiratory disease. Respiration 2010; 80: 161–170.
. Effect of altitiude on the heart and the lungs. Circulation 2007; 116: 2191–2202. Hemodynamic effects of altitude exposure and oxygen administration in chronic obstructive pulmonary disease. Am J Med 1993; 94: 407–412. Effect of aircraft-cabin altitude on passenger discomfort. N Eng J Med 2007; 357: 18–27.
. Long-term oxygen therapy in COPD patients who do not meet the actual recommendations. COPD 2017; 14: 351–366.
. Chronic obstructive pulmonary disease 11: fitness to fly. Thorax 2003; 58: 729–732.
. Problems of altitude II: decompression sickness and other effects of pressure changes. Br Med J (Clin Res Ed) 1983; 286: 1498–1500. High prevalence of respiratory symptoms during air travel in patients with COPD. Respir Med 2011; 105: 50–56.
. Cabin air quality. Aviat Space Environ Med 2002; 73: 211–215. Aerospace Medical Association. Medical guidelines for air travel. 2nd edition. Aviat Space Environ Med 2003; 74: Suppl, A1–A19. British Thoracic Society Standards of Care Committee. Managing passengers with respiratory disease planning air travel: British Thoracic Society recommendations. Thorax 2002; 57: 289–304. Managing patients with stable respiratory disease planning air travel: a primary care summary of the British Thoracic Society recommendations. Prim Care Respir J 2013; 22: 234–238.
. Using laboratory measurements to predict in-flight desaturation in respiratory patients: are current guidelines appropriate? Respir Med 2008; 102: 1592–1597. Pulse oximetry in the preflight evaluation of patients with chronic obstructive pulmonary disease. Aviat Space Environ Med 2008; 79: 518–524. Hypoxemia during air travel in patients with chronic obstructive pulmonary disease. Ann Intern Med 1989; 111: 362–367.
. Air travel hypoxemia with chronic obstructive pulmonary disease. Ann Intern Med 1984; 100: 473–477.
. 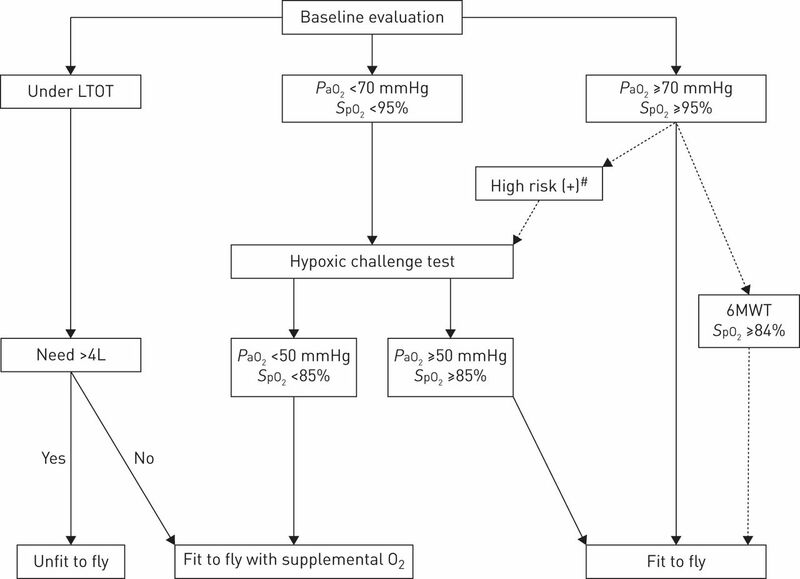 Laboratory assessment of fitness to fly in patients with lung disease: a practical approach. Eur Respir J 2000; 16: 214–219. Walking capacity and fitness to fly in patients with chronic respiratory disease. Aviat Space Environ Med 2007; 78: 789–792. Air travel hypoxemia vs the hypoxia inhalation test in passengers with COPD. Chest 2008; 133: 920–926. Resting and exercise response to altitude in patients with chronic obstructive pulmonary disease. Aviat Space Environ Med 2009; 80: 102–107. Air travel and chronic obstructive pulmonry disease: a new algorithm for preflight evaluation. Thorax 2012; 67: 964–969. COPD and air travel: does hypoxia-altitude simulation testing predict in-flight respiratory symptoms? Eur Respir J 2013; 42: 1216–1223. Vital capacity and oxygen saturation at rest and after exercise predict hypoxemia during hypoxic inhalation test in patients with respiratory disease. Respirology 2013; 18: 507–513. Lung function during moderate hypobaric hypoxia in normal subjects and patients with chronic obstructive pulmonary disease. Aviat Space Environ Med 1998; 69: 979–985.
. Field tests of exercise in COPD. The six-minute walk test and the shuttle walk test. COPD 2007; 4: 217–223.
. Hypoxemia during high altitude: a meta-analysis of chronic obstructive pulmonary disease. Chest 1993; 103: 422–425. The preflight evaluation: a comparison of the hypoxia inhalation test with hypobaric exposure. Chest 1995; 107: 352–357. Flight assessment in patients with respiratory diseases: hypoxic challenge testing vs predictive equations. QJM 2007; 100: 361–367. Predicting the need for supplemental oxygen during airline flight in patients with chronic obstructive pulmonary disease: a comparison of predictive equations and altitude simulation. Can Respir J 2009; 16: 119–124. The prediction of in-flight hypoxaemia using non-linear equations. Respir Med 2013; 107: 841–847.
. Last call for flight simulation test? Eur Respir J 2013; 2013: 1175–1177. European Federation of Allergy and Airways Diseases Patients' Associations (EFA). Enabling air travel with oxygen in Europe. An EFA booklet for patients with chronic respiratory disease. www.efanet.org/images/2013/09/Enabling-Air-Travel-with-Oxygen-in-Europe-An-EFA-Booklet-for-Patients-with-Chronic-Respiratory-Disease.pdf Date last accessed: March 7, 2018. United States Department of Transportation. Federal Aviation Administration. FAA approved portable oxygen concentrators – positive testing results. www.faa.gov/about/initiatives/cabin_safety/portable_oxygen/ Date last accessed: March 7, 2017. COPD and air travel. Oxygen equipment and preflight titration of supplemental oxygen. Chest 2011; 140: 84–90. Comparison of portable oxygen concentrators in a simulated airplane environment. Respir Med 2013; 107: 147–149. IATA oxygen delivery system for adult passengers. www.iata.org/whatwedo/safety/health/Documents/guidelines-oxygen-delivery-passengers.pdf Date last accessed: March 7, 2018. The effects of hypoxia on markers of coagulation and systemic inflammation in patients with COPD. Chest 2010; 138: 47–51. Incidence of air travel-related pulmonary embolism at the Madrid-Barajas airport. Arch Intern Med 2003; 163: 2766–2770. Frequency and prevention of symptomless deep vein thrombosis in long haul flights: a randomised trial. Lancet 2001; 357: 1485–1489.